Successfully Added Sunvell T95V Pro Android TV Box - Android 7.1, 4K Movie Support, Octa-Core CPU, Google Play, Kodi TV, 2GB RAM, Wi-Fi to your Shopping Cart. With the Sunvell T95V Pro TV box at your disposal, you can be assured that not a single moment of boredom will ever enter your household again. Providing you with access to the latest media and Android entertainment - this 4K TV box lets you play games, watch movies, and browse the web in absolutely stunning beauty. Running on an Android 7.1 operating system, this home entertainment system is guaranteed to deliver a smooth user experience that comes packed with the latest mobile features and endless forms of mobile entertainment. Its high-speed Wi-Fi support additionally lets you browse the web at lightning speeds – allowing you to play online games, stream media, and download the latest applications in the blink of an eye. 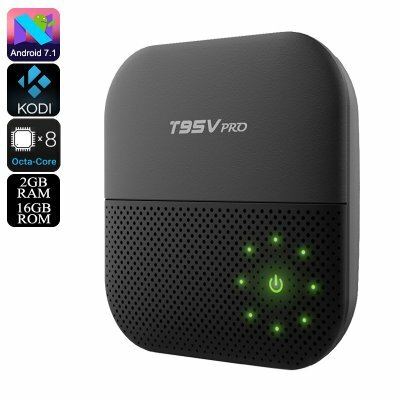 Coming with both Google Play and Kodi TV installed, the T95V Pro 4K TV Box provides you with access to an unlimited pool of free mobile entertainment. Download the latest TV applications, games, videos, and more – this Android 7.1 TV box is the perfect home entertainment system that is guaranteed to bring along years’ worth of fun and entertainment. Supporting Bluetooth 4.0, this TV Box can additionally be synchronized with your smartphone, providing you with the possibility to enjoy all the amazing features your Android phone has to offer on your big screen TV – letting you take the most out of both your smartphone and television alike. Arabic: - مربع التلفزيون ك 4 - Chinese Simplified: - 4 K 电视盒 - Czech: - 4K TV Box - Dutch: - 4K TV Box - French: - Boîte de TV 4K - German: - 4K-TV-Box - Hebrew: - תיבת טלוויזיה 4K - Hindi: - 4K टी वी बॉक्स - Hungarian: - 4K TV dobozban - Italian: - Box TV 4K - Japanese: - 4 K テレビ ボックス - Korean: - 4 K TV 상자 - Malay: - Peti TV 4K - Norwegian Bokmål: - 4K TV boks - Romanian: - Caseta de TV 4K - Russian: - 4K TV Box - Spanish: - 4K TV Box - Thai: - กล่องทีวี 4K - Turkish: - 4K TV kutusu - Vietnamese: - 4K TV Box.